I assure you that if you are patient with me, come with a willing mind and heart(ready to learn), you will receive more than what you might have asked for, in seeking the perspective of a Ras Tafarian’s I-sight (eyesight) if those who actually open up their Bibles to read in a Jewish/Hebrew cycle of readings, & thoroughly discern, have come to seek insight) into the study of the Scriptures. So,with this Hebrew Shabbot (or Shabbat) we move into the opening of the Torah portion with C(K)ḥukat – חֻקַּת, on the 6th – ו, & on the 7th – ז, of the month of Tammuz – תמוז, in the year of 5777. (the Hebrew Calendar corresponds to a Lunar cycle of the Moon) From an Ethiopic-Christian perspective and calculation, where the current year is 2009/7509; these readings from the Scriptures would align to what is known as YeHíggu T’îzáz Yih’ Näw – የሕጉ ትእዛዝ ይህ ነው, on the 23rd – ፳፫, & on the 24th – ፳፬, of the month (ወርኀ) of Sänæy – ሰኔ. The Ethiopic calendar, which is solar (with its correspondence to the Sun) aligns to this Sabbath (or Senbet – ሰንበት) in the Ethiopian language of Amharic which is currently one of the languages of the Ethiopian Orthodox Tewahedo Church (the other language being Ge’ez – ግእዝ). 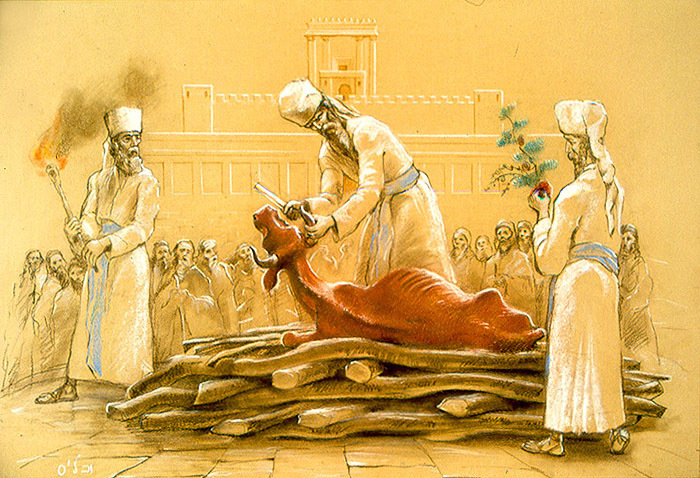 On this Sabbath, we study where Moses and his brother Aaron, receive the ordinance of the law, in which God commanded them to take a “red heifer,” in the order for sacrifice/offering. 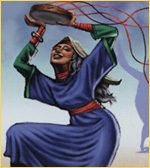 Instead of this offering being of the male of the first year, this one was to be of the female; also, she was not to be offered in the Tabernacle (Mishkan/Dinkʷan) but, to be offered outside of the camp, for her blood was to be sprinkled seven(7) times before the Tabernacle of the congregation, with the finger of Eleazar (Levite priest-son of Aaron). The law for the death of a man in a tent, was also given to the children of Israel, in this portion of the Scriptures. Seven(7) days shall the tent, any open vessel, which hath no covering, whosoever touched the one slain/deceased, in the open field, or the grave would be unclean. As the journey in the wilderness continued, the children of Israel grew restless once again. The congregation gathered themselves together against Moses and Aaron. They spoke ill off them, bringing them further into the wilderness to die of thirst, for there was no water. Moses and Aaron went before the Tabernacle and fell on their faces(bowing in a plea to God). God appeared to them, and spoke to Moses, instructing him to take his rod and gather the assembly of the children of Israel with Aaron. Then he was to speak to the Rock, in front of the Hebrews and there water would come from the Rock; enough for the entire community of Israel. 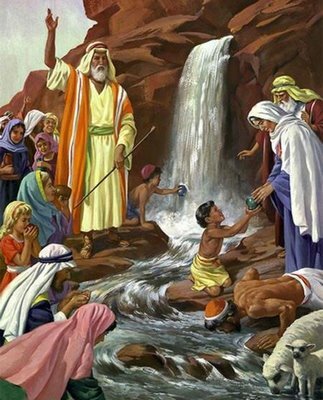 Moses, along with Aaron gathered the people and brought them before the Rock, but in frustration with the constant murmuring and doubt of the children of Israel, instead of speaking to the Rock, Moses struck it with his rod, twice and water came from quenching the thirst of all the people and their cattle. 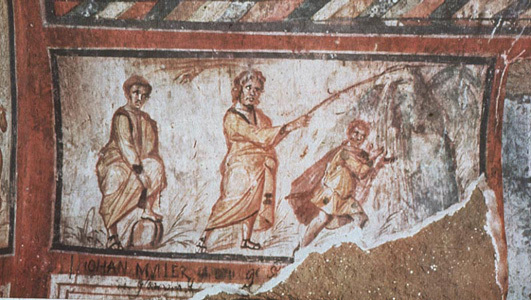 Water From The Rock _wall painting of Moses in a Roman Catacomb dating to the 4th century AD. Moses then sent messengers from Kadesh to the king of Edom, requesting safe passage through the land of Edom, assuring that nothing would stolen and the Hebrews come not to quarrel with any of the inhabitants of the land. 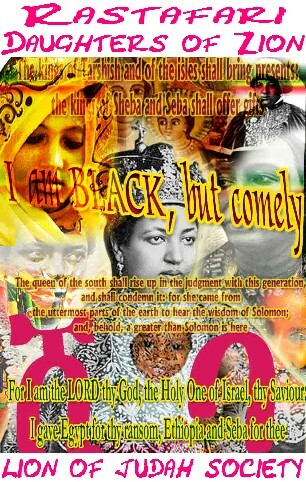 But, Edom would not allow Israel to pass through the land. Edom warned Israel that if Israel was to pass through Edom would come out with the sword. Moses speaking for Israel, assured again the nothing would taken and if so, it would be recompensed but, Edom refused once again; and came out to divert Israel from their path. 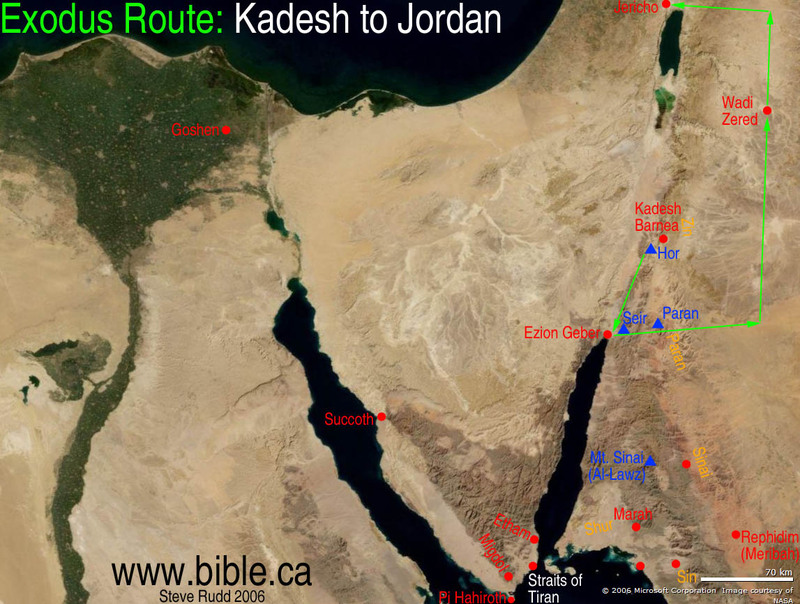 Israel, then turned away from Edom and journeyed from Kadesh to Mount Hor. God, then spoke to Moses and Aaron at Mount Hor. God said to them that Aaron (Moses’ brother), would be gathered to his people, and not enter into the land promised, to the children of Israel’s forefathers,for the rebellious actions at the waters of Meribah. So upon Mount Hor, Aaron’s place as the Kahin HaGadol(High Priest) would pass along to his eldest son, Eleazar. Moses was to take the garments and vestments of the High Priest and placed on and in the possession of his nephew, Eleazar. Aaron then passes, leaving the Priesthood in the hands of son Eleazar, at Mount Hor. A Canaanite king, whose name was Arad, heard word of the children of Israel making trek to Canaan and he went out to fight against them and took some of them prisoners. 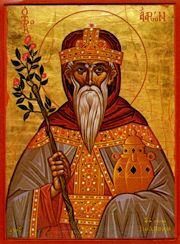 Israel, made vow with God, that if those of the Canaanite king Arad, who took some of the Hebrews as prisoners, were delivered into their hands, they would utterly destroy their cities. God heard them, and gave way to for them to keep their word, and it was made so, to the extent that the place where the king Arad, the Canaanite dominion was, would be called Hormah,for it was close to Mount Hor, where the passing of Aaron, was. 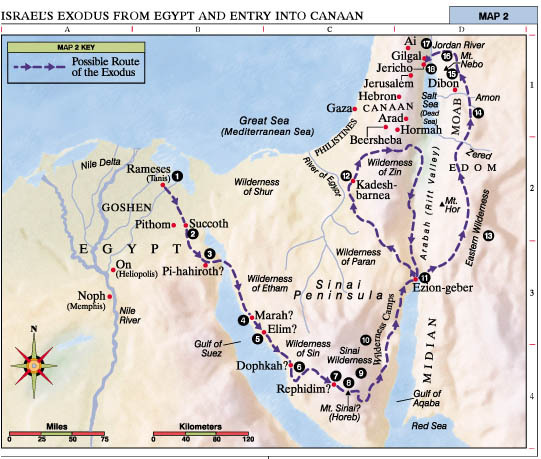 After the victory over Arad, the Canaanite king, the children of Israel journeyed from Mount Hor, by the way of the Red Sea, to go around the land of Edom, and then the soul of the people grew weary, becoming discouraged. Again, they spoke against Moses, moaning and groaning for food and water. God sent fiery serpents, among the people and were bitten by them. Many of the children of Israel died because of this, and turned to Moses, asking him to forgive them their doubt, and intercede with God for them. 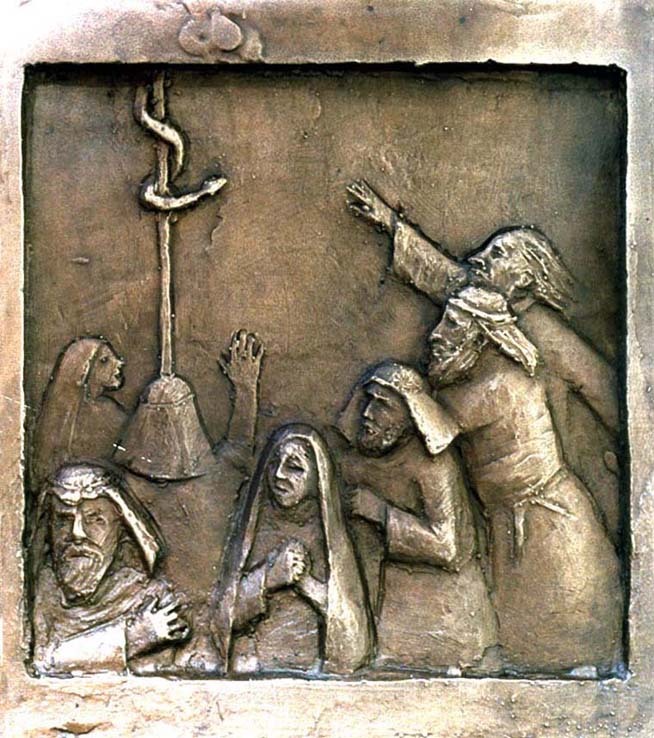 Moses prayed for them and God instructed Moses, to make a fiery serpent, and set it upon a pole so that every one that looked upon it would live. Moses made a serpent of brass, and put it on a pole and what God said, had come to pass. Those that looked upon the Brazen Serpent lived, in spite of being bitten by the other serpents. 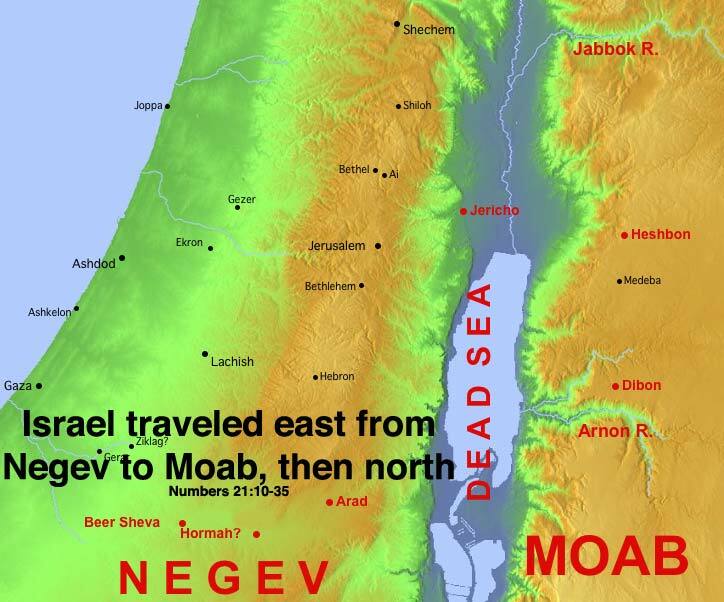 The children of Israel set forward and then, making their journey East around Edom; (From Kadesh-through-Moab) until they came to Beer (pronounced Ba-e’yr) where they then were given water to drink from God. Israel, sent messengers to Sihon the king of the Amorites, requesting permission safe passage through the land of the Amorites, in the same manner that Israel requested of Arad, whom was a Canaanite king. Israel would not take anything that was not their own and would not quarrel with any of the inhabitants of the land of the Amorites. Sihon, wouldn’t let Israel pass through either, and gathered all his people together, to go out against Israel. 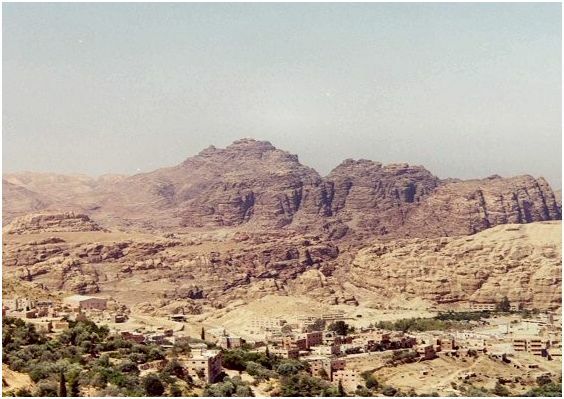 At Jahaz, the Amorites fought against Israel; Israel smote the Amorites with sword and then, possessed the lands from Arnon-to-Jabbok, even to the borders of the children of Ammon. While Israel, dwelt in the land conquered of the Amorites, they also drove out the Amorites in Jaazer. The children of Israel then, went north, and Og, the king of Bashan, cam out against them but, God told Moses “…to fear him not…,” for he to would be delivered into his hand. There Israel, smote them and possessed the land there, as well. 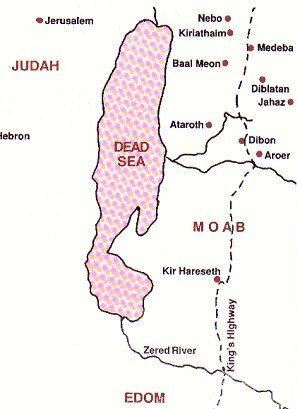 Wherein, at that point, the children of Israel pitched camp in the plains of Moab, on the side of Jordan (river), near Jericho. 1) Islamic, Sura al-Baqurah (سورة البقرة‎), has a strong connection with this week’s Torah portion/study. 2) Could the teachings of the Kundalini Energy have a connection with the Brazen Serpent? -2a. Did the aspects of the Brazen Serpent influence modern medicine? 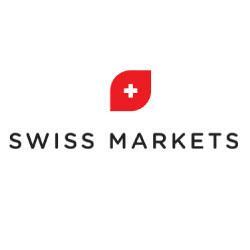 3) Biblical reference to the serpent, in lieu of, wisdom/intelligence or a positive perspective….